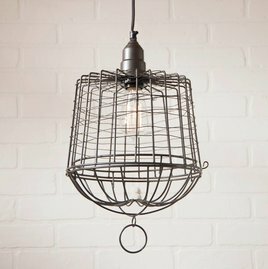 Your farmhouse styled home won't be complete without the punched tin Drum Chandelier. A stunning addition over any table or island. 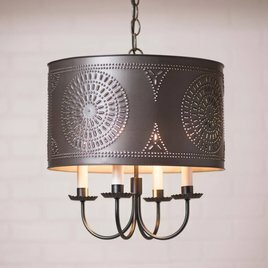 The punched shade is a stunning accent to the drop chandelier arms. Made in the USA. 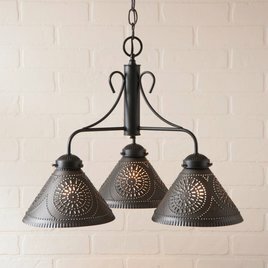 An updated look for our ever popular Medium Norfolk Chandelier body is the addition of four downsweeping arms adorned with pierced tin shades that creates our Crestwood Chandelier. A beautiful farmhouse design. 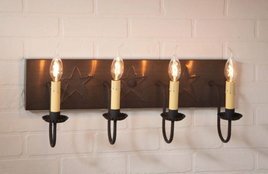 The 4 Light Farmhouse Vanity Light with Stars in Blackened Tin was designed with a country bathroom in mind, the rusty star mirror lights will finish off your small room in the house with flair and country charm. Made in the USA. 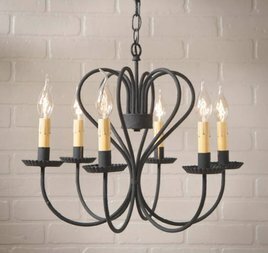 Loved for its simple sophistication the Sheraton 6 Arm Chandelier brings you a beautiful centerpiece for any dining table. Today's technology with the look that will convince visitors it belongs there! Made in the USA. 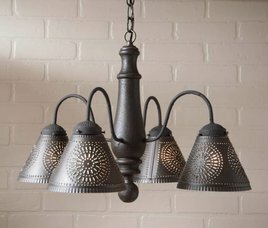 This large Georgetown Chandelier has decorative & sweeping arms that bring a clean & simple design that works in most any home. 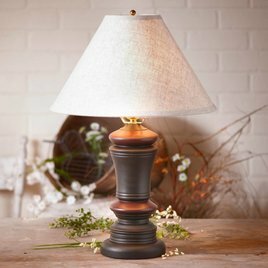 This statement piece has a simple elegance that brings a warm light to any space. Made in the USA. 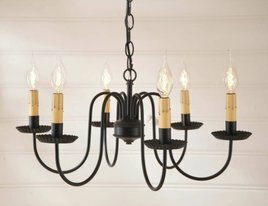 Your family and friends will bask in the cozy lighting effect produced by the four sweeping arms & the pierced shades. 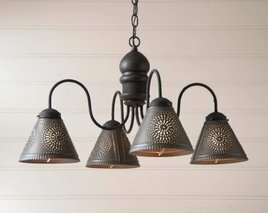 With its painted wood center, our Cambridge Chandelier is equally at home over a dining room table or in a farmhouse kitchen. 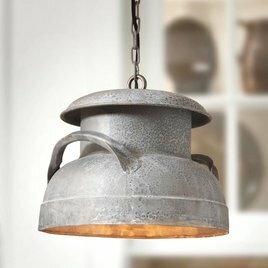 Add the timeless Barrington Island Light over your island or sink area. 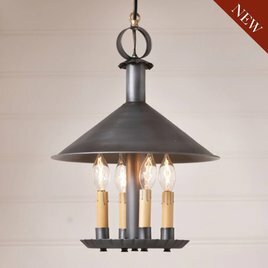 This large light brings a great light to large tables or in game room areas as well. Finished with a black powder coating & accented with Kettle Black finished shades.